MagVigen™ DNA Select nanoparticles are ideal for DNA purification. MagVigen™ DNA Select nanoparticles feature efficient recovery of double-stranded and single-stranded DNA. DNA products are captured by MagVigen™ DNA Select nanoparticles following a short incubation. The generated nanoparticle-oligo complex can be separated from the rest of the sample by magnet. The retained genomic material can be eluted from the nanoparticles using an elution buffer. MagVigen™ DNA Select nanoparticles enable the purification of DNA products from salts and other contaminants from assay samples, e.g. cell lysate. The purified DNA products can be further analyzed by gel electrophoresis, PCR quantification and sequencing. DNA Select nanoparticles for capture. Scale up accordingly if DNA quantity or sample volume increases. All materials should be stored at 4°C. Remove MagVigen™ DNA Select nanoparticle solution from storage and bring them to room temperature. Vortex MagVigen™ DNA Select nanoparticles for 10 seconds before use. For every 20μl DNA sample containing no more than 1,000ng DNA, add 40~9 μl volume of beads from Easy DNA Select. Note: A volume ratio of (A)2.0:1 to (B)0.7:1 for MagVigen Nanoparticles : DNA Sample can be used to separate DNA ≥ (A)100bp to (B)400 bp, One can test different ratios to achieve desired DNA size selection. Note: It is ideal not to introduce bubbles during the capture reaction. Incubate the MagVigen™ DNA Select nanoparticles-DNA reaction at room temperature for 5~15 minutes. After incubation, use the magnet to separate the DNA- captured nanoparticles from the solution. Carefully remove the supernatant with a pipette, taking care not to disturb the DNA-captured nanoparticle pellet. Keeping the magnet in place, wash the DNA-captured nanoparticle pellet by adding 100μl freshly prepared 75% ethanol. Let it stand for 3 minutes. Note: Adjust the volume of ethanol as needed to sufficiently cover the DNA-captured nanoparticle pellet. Remove and discard the ethanol solution. Repeat steps 8~9, performing a total of two washes. Air dry the beads for 2~10 min. Elute the captured DNA from the nanoparticles by adding 20μl of the Elution Buffer. Note: The volume of the Elution Buffer can be adjusted as needed. Gently pipette to mix well and incubate for 5 minute at room temperature. Note: It is ideal not to introduce bubbles during the elution reaction. Separate the nanoparticles from the eluted DNA with magnet. Transfer the supernatant containing the DNA products to a clean tube. The purified DNA is ready to use for downstream applications. Table 1. General guidance for the ratio of MagVigen™ solution vs. DNA sample solution to achieve desired DNA size cut off (100 bp~500 bp). One can titrate different ratio to identify the best condition. Figure 1. shows the sizing results by adjusting the ratios of beads volume vs. DNA sample volume. 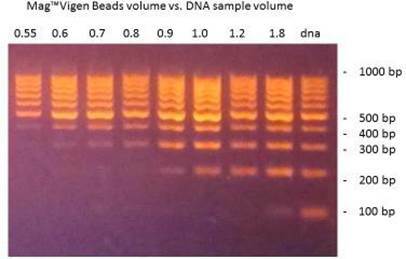 Themo Scientific GeneRuler 100 bp DNA ladder and 2% agarose gel were used. © Copyright 2011-2018 NVIGEN, Inc. All rights reserved. NVIGEN, Inc. Nanobeads Reagents Are For Research Use Only.